Topshop has relaunched their beauty line and holy.moley. It’s beautiful. I wanted to do some swatches because I couldn’t find any online. I’m lucky enough to live in Los Angeles, where we have our very own Topshop store! I stopped by and spent over two hours swatching all the new products. I felt like a kid in a candy store. It was absolute heaven. Shout out to Noella, the sweetest Topshop employee who showed me her favorites and also took my picture for me! Topshop, give this woman a promotion asap! 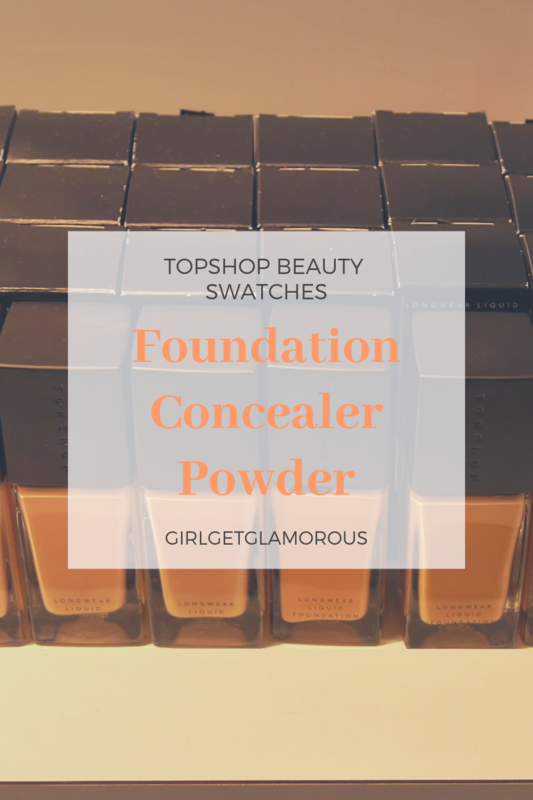 If you aren’t familiar with Topshop beauty, it’s a full line of products: primers, foundations, concealers, blush, highlighter, eye shadows, brow products, lipsticks, bronzers and powders. The line is priced just above drugstore prices but below mid and high-end brands. The best part of the line is that the products DELIVER. The quality is so good that it rivals or beats high-end brands. Most of the line is produced in Italy by the same manufacturers of some very well known, high-end brands and the pencils are produced in Germany (known for producing the best pencils). This means you are getting top quality at a very decent price. Price | The entire range is priced between $13-$22 USD. Packaging | The relaunched line has sleek metal and black packaging. The packaging feels luxurious and high-end, with a nice, moderate weight. Cruelty-free | The entire line is certified cruelty-free by Leaping Bunny, which is super hard to get. This means no product or ingredient was tested on animals at any point of the production process. Shop | You can shop Topshop Beauty online or in some stores. Before we get to the photos, to be honest, the lighting in Topshop was not great. I will add more as my order comes in and can take photos of my shades in better lighting. But I wanted to get the full range so that everyone can find their shade. The Topshop sales staff did say they were anticipating the brand adding more shades with different undertones. I did have to combine shades to find matches for foundation and possibly concealer. They do have shades from fair to deep. Additionally, the links below are all my affiliate links, which means I get a small commission if you make a purchase using this link, at no additional cost to you. I ask that you please use these links if you found this post helpful, as it helps support future blog posts. Thank you! Longwear Liquid Foundation, 1 oz, $22, available in 12 shades. Texture | Slightly thicker than I expected, blended easily, set to a dry touch, matte finish. Packaging | glass bottle, black top, pump dispenser. Texture | liquid, thin, spreads easily, set to a soft matte finish. Built to full coverage (pictured below) with several swipes. Packaging | plastic tube with wand applicator and sponge tip. Texture | very silky, minimal powder kick up. Medium Coverage, adds color. Very impressed the the silkiness of these powders. Packaging | pressed powder in pan, sleek metal compact. The lighting was especially rough in this corner. Each shade looks lighter and warmer than it did in person. I still wanted to grab a picture so that you could get a general idea of each shade. I hope this post was helpful!! I will do a review and try-on post soon, when my order comes in and then link that post here. For now, I wanted to get swatches up, because Topshop does not allow returns on opened or used cosmetics, so you definitely want to get the right shade. Leave me a comment below if you pick anything up from the Topshop Beauty relaunch! I want to hear what you get and what you think of Topshop Beauty. As always, thank you for reading and being a part of the blog! Topshop Beauty Relaunch Part 2 | Lipstick . Lip Gloss. Lip Liner.